The annual conference of the Electoral Action of Poles in Lithuania took place on 30th January in the House of Polish Culture in Vilnius. Its main part was the ceremony of honouring the seniors – parties’ leaders. Before the ceremony Wanda Krawczonok, the chairman of the Vilnius Division of the Electoral Action of Poles in Lithuania (AWPL) [Polish: Akcja Wyborcza Polaków na Litwie; translator’s note] and a member of the Lithuanian Parliament, recounted the story of how the list had been created and introduced the people gathered to the criteria of selecting the activists specified by the party’s General Council. “Drawing up of this list was quite a task, as deserved people constitute a huge number. On a meeting of the party’s Council the criteria were established. First, we decided to honour the leaders, so people who were leaders within the AWPL framework; I mean General Council and executive committee members, as well as people who occupied managerial positions in local governments. The next important criterion was the thing that those people have been with us to this day – that they have not left us in difficult moments and have stuck to our unity. And as we know that part of the deserved people is still occupying positions or working within our framework, we decided that they will be included in the list later,” Wanda Krawczonok said. Valdemar Tomaševski, the party chairman, gave the deserved activists thanksgiving diplomas, flowers, and gifts in person. “Following the words of our Great Compatriot, we would like to express our gratitude for the personal work involvement of many years within the AWPL framework for the good of the “Wileńszczyzna” [a territory that once was part of the Republic of Poland and is still inhabited by Poles among others; translator’s note] inhabitants. “You belong to the generation that got consciously engaged in the Poles’ national rebirth in Lithuania, thus taking on the responsibility for our mutual fate here. Today, looking back at the hardships and obstacles that we overcame together, we can be glad with all the things we managed to achieve and do it with clear satisfaction. We owe it to your earnest and devoted, sometimes actually unappreciated, work involvement, as well as very hard and important effort for the mutual benefit. “Thank you for your all-important understanding, which reflects in the social engagement for the benefit of the Wileńszczyzna inhabitants; for the sacrificial commitment of your own time and energy to the region; and for the active attitude and hard work, which will still serve as an example to the young generation. Some of the Polish community leaders have already passed away, and so their families had been invited for the celebration. Several hundred people gathered in the hall of the House of Polish Culture and with one-minute silence honoured those who had steadfastly continued the fight for Polishness but already passed on to eternal life. “…our heritage is great, but it is hard as well. 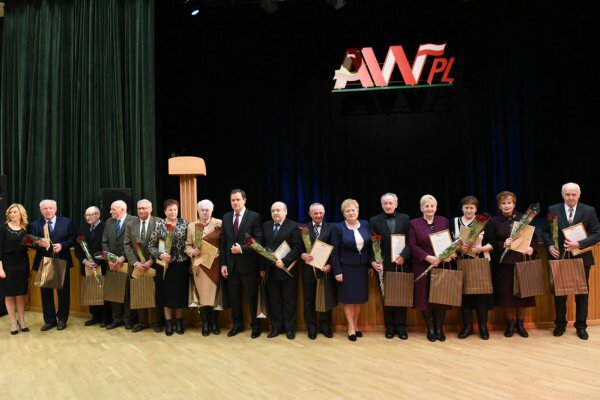 “With these words of thanks we would like to express our greatest respect and gratitude to the family members for their personal contribution to the mutual act, which is with the benefit for the Poles’ national rebirth in Lithuania; and for many years of involvement in the social work aiming at the good of the “Wileńszczyzna” inhabitants. Teresa Paramonowa, the deputy mayor and a long-standing councillor of the Vilnius-region local government, thanked on behalf of the honoured for such a nice and cordial gesture. She proclaimed that despite their age, the honourable leaders were still willing to bring help and undertake activity when needed.